Best Thai Chicken Lettuce Wraps you’ll ever make – and eat! Oh September, how quickly you’ve snuck up on us. I can’t believe the summer is (unofficially) over. It really seemed to fly by, but then again, doesn’t it always? We decided to make the most of the last long weekend of the summer by hosting dinner for some friends on Friday night, and heading up north to our friend Jay’s cottage for pretty much the rest of the weekend. In between, we also managed to make it to Aberfoyle Antique market, this amazing open-air antique market in Guelph, Ontario. D and I love, love antiquing but found that going with Nate proved to be a bit tricky. Next time, we’ll go sans baby and spend more time there. But back to our Friday night dinner. Since my friends, D and I love Asian food, I decided to cook up an Asian fusion feast. 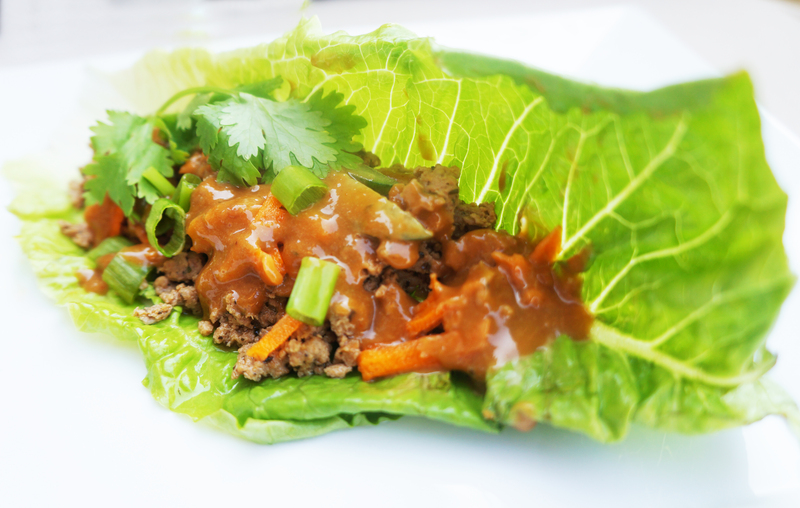 I was looking for the perfect Thai lettuce wrap recipe, and adapted elements from two different ones I found online. I used a chicken filling recipe that I found on Pinterest (big surprise there) from CopyKat Recipes and an amazing peanut sauce I found on the Cozy Apron blog. I changed a few things and the result was delicious. So fresh, sweet, spicy and savoury all at once. I highly suggest you try these out. Like, tonight. First, prepare the sauce by combining all sauce ingredients in a food processor or blender (Admittedly, I used my son’s baby bullet since it’s so handly and the perfect size for sauce). Blend until smooth. If it seems too thick, add a tiny bit more water. Set aside. Combine ground chicken, basil, soy sauce, lime juice, minced garlic and Sriracha chili paste in a bowl and stir to blend well. Heat both oils in a medium sized pan and add the chicken mixture and sauté until the chicken is cooked through (about 5 minutes). I set up my platter as a ‘make your own lettuce wrap’ station; I placed the serving dishes with the chicken and the sauce in the center, and arranged the lettuce leaves on either side. I then arranged the shredded carrot, green onion, avocado, cilantro and peanuts on the other two sides. The sauce is definitely the best part, and can be used as a salad dressing, marinade….really anything! « Best. Salad. Ever. Ever. Ever. Just made these for dins…. YUM! Thanks Chef Monica.